Carson Medical Group’s priority is the health and well-being of our patients, their families, our staff and the community. The physicians and health care providers at Carson Medical Group firmly believe in the effectiveness of vaccines to prevent serious illness and to save lives. Immunizations have been, and continue to be, one of the most researched medical practices in modern history. Immunizations are overwhelmingly safe. Immunizing your child using the current Center for Disease Control (CDC) schedule is the right decision. Simply, immunizations save lives. 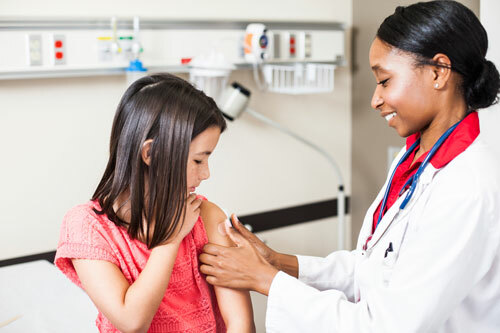 • To receive the highest benefit of vaccinations, the providers strongly encourage families to vaccinate based on the CDC’s current immunization schedule. • While a delayed schedule may be approved by your provider, immunizations must start by six months of age and all children must be on schedule to be fully vaccinated by the age of two. • The MMR (measles, mumps, rubella) and DTaP (diphtheria, tetanus, pertussis) are not permitted to be delayed and must be given on-time according to the CDC vaccine schedule for the protection of other patients present in the office. • Children who are currently behind on immunizations, or join the practice with no or partial immunizations, must begin receiving immunizations immediately. While the CDC’s immunization catch-up schedule is highly recommended, at a minimum the patient must remain on track to become fully immunized within two years. The only approved exception to this policy is a medical contraindication to one or more vaccines as determined by the patient’s healthcare provider. Examples of possible medical contraindications include: patient has a severe allergy to one of the components of the immunization, patient is experiencing severe immune suppression, patient has a close contact with an immune-compromised person precluding immunizations, and/or the patent has an illness precluding immunization(s). We, the providers of Carson Medical Group, acknowledge and honor your rights as parents/guardians to make any and all healthcare decisions for your child(ren). We will not force you to immunize your child(ren) against your wishes. If you cannot comply with this policy, we respectfully ask that you find a healthcare provider more apt to meet your preferences. We do not have a list of providers who allow immunizations refusals. Further, we do not recommend a provider who does so.